This is a page about 2018 New Year Events for the Sumida Hokusai Museum. Enjoyable event that visitors experienced traditional Japanese New Year costume ex. 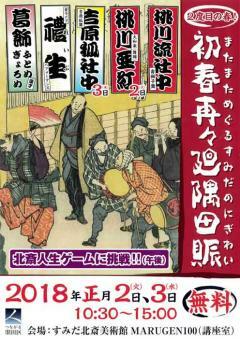 Shishimai, fox dance, calligraphy, comic diaouge (漫才) and Japanese traditional board game(双六). The head of Momokawa family is dancer who has taught lion dance, Classic Japanses dance and Edo kappore for 36 years. Many pupils ex. comedian, performer and actor, learnt from her at the training room where is located in Sumida city. In this event, she will perform lion dance which is necessary for celebration and Hokusai dance which she has trained for long time. Yamatogaku had created at the first of Showa period was flourishing music by 40s of Showa period. This genre combined western vocalization and harmony. One of songs “Edo furyu” represented a lifestyle and mood of Edo period inspired from Hokusai’s masterpiece “Thirty-six Views of Mt Fuji”. Yoshiwara Kitsune mai (Yoshiwara fox dance) which Hokusai depicted in “Picture book of the Sumida River – Both bank at a Glance, Yoshiwara no shunen”, was performed in Yoshiwara in the New Year’s Eve in the Edo period. Today’s one doesn’t have only one style or format of dancing. Performers who wear fox masks dance according to the fox face appearance. Fox is said to be god of inari schrine and bring abundant crops. Based on this idea, fox dance expressed the meaning of purification ceremony, however you can enjoy playful comedy in this dance. Please enjoy unique dance. He was an artist borned in Obuse where Hokusai often visited and live in Sumida city. His works mainly categorized on calligraphy and contemporary art. His works was displayed Japan expo Paris in 2015, and then international art fairs in new York, Miami, Santa Fe, Busan and Daegu. He organized art event “Artzoo 2018” in national court gallery. Our museum’s official ambassador, comedian “Katsushika Hutome and Gyorome”. They aim to promote museum and warmup the museum events. They providing an entertainment way to gain a deeper understanding of Hokusai by singing dancing and performing comedy show.